The biggest falsehood in Stephens’s piece is that Jews were welcomed to the United States in earlier times, but Muslims are blocked now. In fact, Jews were prevented from coming into the country during the Holocaust, and many of them died because of it. Muslims, by contrast, have several dozen Muslim countries to choose from if they want to get out of their own…holes of origin. It’s sad to watch Stephens trying to use the suffering of the Jews as a passport to import more Muslims into this country. This insidious piece is authored by the New York Times’ pet “conservative,” Bret Stephens. Stephens claims he is merely conducting a “thought experiment.” He says that Jewish immigrants from the early 20th century had much the same characteristics as Muslim and third-world immigrants of today, so banning Muslims today is like banning Jews in the past. Stephens claims that some Jews who came to America harbored communist views. True. He implies we are meant to compare that to Muslims who believe in sharia law. But there is a difference. Jews who came to America, even communist Jews, did not blow up the Empire State Building or drive cars into crowds. They did not murder people screaming, “Moses is great!” or “Abraham is great!” Some of them had awful views, and they probably had equally awful voting records, but that’s as far as it went, for most of them (except, admittedly, for the awful Rosenbergs). Stephens also claims that Jews who came to America did not assimilate in succeeding generations. He must not have been paying attention. Does Treasury secretary Steven Mnuchin look unassimilated? How about former attorney general Michael Mukasey? William Shatner? Jerry Seinfeld? Stephens also claims that Jews who came to America were uneducated. Some were, but many weren’t. Furthermore, Jews valued education and quickly became among the most educated segment of the country, despite rampant discrimination. Nor can you go around the country and find Jewish “barrios” where all signs are in Yiddish. When you call a business on the phone, you never have to “press 1 for English” in order to avoid a voice menu in Hebrew. The Jews, clearly, have assimilated. So Stephens’s comparison is entirely false. Many Muslims who come here don’t assimilate, and many not only have radical views, but even act on them, murdering Americans. As for other “third-world” immigrants, many of them are not only illiterate in English, but illiterate in their own languages as well. Stephens calls Attorney General Jeff Sessions a “bigot” for having legitimate security concerns about immigrants from Muslim countries. Stephens, a recent arrival at the New York Times, was formerly a mouthpiece at the Wall Street Journal and was quite at home with the open-borders corporatist crowd that wants cheap imported labor. Israel is proposing to prevent foreign supporters of BDS from entering Israel, although ministers have the right to deny individuals entry on a case-by-case basis, as in the case of Omar Barghouti, one of the founders of BDS, who is married to an Israeli citizen of Palestinian origin. On January 7, 2018, Israel announced it plans to establish a task force to identify the hundreds of activists already in Israel and deport or deny entry to individuals who support BDS. Commenting on President Woodrow Wilson’s “long overdue ” decision to enter World War I, Winston Churchill wrote that if the president had acted earlier, it would have meant abridgment of the slaughter, sparing of the agony, and prevention of ruin and catastrophe. Even if the parallel is not exact, Israeli authorities are acting to prevent further harm to their country by imposing a travel ban blocking members of organizations supporting BDS, the Palestinian-led boycott, divestment, and sanctions movement, from entering the country. Mark Twain in his book Innocents Abroad wrote that travel is fatal to prejudice, bigotry, and narrow-mindedness. Unfortunately, as Israel has found, hostile activists can also encourage those qualities. The travel ban implements the intention of the law passed in March 2017 that bars entry into the country by groups that actively promote anti-Israeli boycotts. The ban is virtual recognition of the adage, “Oh, I have taken too little care of this.” Israel has now taken the offense against those who are not simply rational critics of Israeli policies and actions, but either implicitly or explicitly refuse to acknowledge the legitimacy of the State of Israel or seek its elimination. By banning any foreign activist who has knowingly signed a public call to boycott Israel or pledged to take part in a boycott, Israel is preventing harm to its citizens. On January 7, 2018, Israel issued a ban on 20 worldwide organizations, including 11 European and six U.S. groups, that are involved and active in BDS activities. They include the American Friends Service Committee (AFSC); Code Pink; the U.S.-based Jewish Voice for Peace; the U.K.-based Palestinian Solidarity Campaign; of which Labor Party leader Jeremy Corbyn is a patron; the British group War on Want; and BDS organizations in France, Italy, Norway, and the Netherlands. It is worth looking, if only as illustration of hypocrisy, at War on Want, an organization founded in 1951 in London as an antipoverty charity. It supported liberation movements in Africa. For a time, the anti-Israeli George Galloway was its general secretary; during that time, there were accounting irregularities, and reports were “materially misstated.” In 2006, War on Want launched its Palestinian Rights movement and advocated BDS, calling for an embargo on arms to Israel. Let us be straightforward on this controversial issue. The argument against the travel ban is that it violates freedom of expression, and of course, to some extent, this is true in a democratic country such as Israel. The problem with this is that not only does the freedom to call for a boycott exist everywhere, but much of the expression on Israel is based on falsehood and misrepresentations and the Palestinian Narrative of Victimhood. The BDS campaign calls for economic, cultural, and academic boycotts against the State of Israel and Israeli citizens. But its real intention is not to advocate measures to alleviate the condition of Palestinians, but to implement the Palestinian campaign for the academic and cultural boycott of Israel, founded mainly by Omar Barghouti, to refuse to recognize Israel as a legitimate state. What is important is that boycott activity is counterproductive, against peace. It results in increasing hatred, and as Israeli president Reuven Rivlin has remarked, it symbolizes all that stands in the way of dialogue, debate, and progress. It is against cooperation toward a peaceful solution of the Israeli-Palestinian conflict. A reminder of the past may be helpful in understanding the Israel travel ban. On November 9-10, 1938, Kristallnacht occurred in German cities, with a pogrom against Jews, involving murders; beatings; and destruction of Jewish property and businesses as well as synagogues. At the core and the call to German citizens was a boycott of Jews in all forms. Obviously, actions such as calling for Israel to be excluded from international oganizations such as the world soccer governing body FIFA and the insistent commands by rock star Roger Waters to fellow performers not to perform in Tel Aviv are not on a par with the Nazi Holocaust, but it would be foolish to ignore the implications of BDS. Implicitly if not explicitly, it promotes anti-Semitism as well as tolerating terrorist activity against Israel. It does this by not criticizing the funds that the Palestinian Authority (P.A. ), through its Martyrs’ Fund, gives to terrorists in Israeli prisons or to the families of those terrorists killed by Israel. It is encouraging that the U.S. Senate by the Taylor Force bill is considering the issue in an appropriate way. Named after the American citizen, a former U.S. army officer and a Vanderbilt University student, murdered in March 2016 by a Palestinian terrorist in the West Bank, the Taylor Force Act, introduced in 2016, aims to stop all U.S. economic aid to the P.A. as long as it continues to pay those salaries to terrorists and families. The Israeli travel ban might be considered in the context of the continuing war on Jews. It is three years since Hypercacher, the Jewish Paris supermarket, was attacked by terrorists. Four were killed. Coinciding with the Israeli travel ban, on January 9, 2018, an arson attack burned down a French kosher grocery store in Creteil, a suburb of Paris, and the store was completely gutted by fire. Six days earlier, two stores in the area were targeted with paintings of swastikas. Hatred and anti-Semitism: this is the real essence of the boycott of Israel and Jews. Even before Donald Trump’s Jerusalem declaration there was no shortage of anti-Israel agitation going on, as readers of this blog know well. But times are changing, and so are the attitudes of those confronting this bigotry, in particular the Israeli government which has finally woken up to the threat of BDS and delegitimization and is starting to act in a coordinated manner to combat it – with some success. Israeli authorities announced on Thursday [30th Nov.] that Swiss diplomats will not be allowed to access the Gaza Strip because of their ongoing contacts with the EU and US-classified terrorist group Hamas. 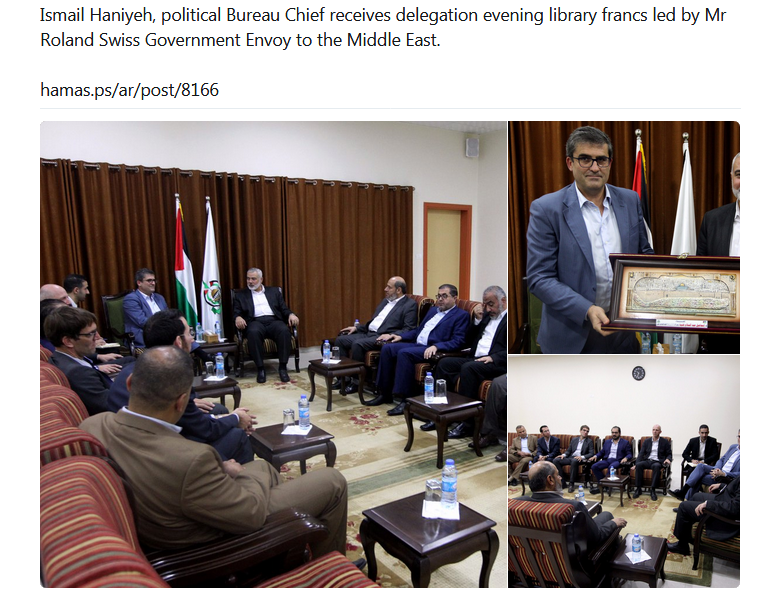 Switzerland, a non-EU country, does not recognize Hamas or Hezbollah as terrorist organizations. Foreign Ministry spokesman Emmanuel Nahshon told The Jerusalem Post on Saturday that Israel declines to comment on the ban. A photograph of Hamas leader Yayha Sinwar and Swiss diplomat and representative for the Palestinian Authority, Julien Thöni, at a joint Tuesday meeting sparked irritation from Defense Minister Avigdor Liberman, according to a report in the Swiss daily Basler Zeitung. How “neutral” can you get? Switzerland, which benefits from a “halo” image of a human-rights benefactor, does not recognize one of the pre-eminent terror organizations in the world as a terror organization? This is mind-boggling. I am pleasantly surprised that Israel has found the backbone to stand up to this Swiss hypocrisy, not to say idiocy. Israel has pulled out of a planned exhibit of the Dead Sea Scrolls in Frankfurt because the German government would not guarantee their return if claimed by Palestinians or Jordanians. No country on earth would allow its precious artefacts to be exhibited in another country if that country would not guarantee their return. What gives the Palestinians the right to claim the Dead Sea Scrolls as their own? They contain pieces of parchment describing Jewish history, Jewish laws, and Jewish customs of Jewish sects who were hiding in caves in the desert during the Roman occupation. They have no connection whatsoever to the Arabs, whether in the form of Jordan or the Palestinians – who only came into being in 1964! The chutzpah of the Arabs to attempt to claim these scrolls as their own is paralleled only by the Germans’ bending over backwards to accommodate these potential claims. The Frankfurt Bible Museum announced that it has canceled the exhibit which was scheduled for a September 2019 opening. Its director, Jürgen Schefzyk, said he regretted the German government’s decision, adding that neither Holland nor Austria would have hesitated to issue general immunity guarantees. 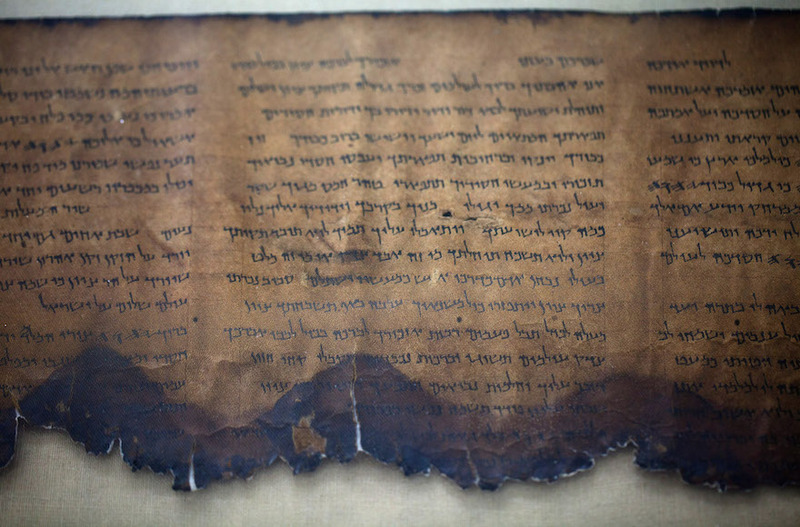 According to German news reports, the government guarantee would have blocked Palestinian or Jordanian authorities from contesting the provenance of the scrolls, which are among the oldest known texts related to the Hebrew Bible. “Because of the unwillingness of both ministries to give the necessary declaration, as Qumran lies in today’s West Bank, the Israel Antiques Authority is not letting the material out of the country and the Bible Museum had to cancel its plans,” Uwe Becker, the deputy mayor of Frankfurt, told The Jerusalem Post. Becker expressed outrage at Germany’s foreign and culture ministers on Thursday, sending letters to Culture and Media Minister Monika Grütters and Foreign Minister Sigmar Gabriel asking them to change their position to support the exhibition. “If Germany is unwilling to clearly express the legal status of the fragments of Qumran as Israeli world-cultural-heritage goods, it would dramatically change the coordinates in our German-Israeli relations. And it would mean the construction of a wall toward the places of the birth of Christianity in the holy country, because it would be the same for Bethlehem, Jericho, east Jerusalem and many other places of Jesus’s work,” Becker said. Becker, widely considered one of Israel’s strongest supporters in the federal republic, led a legislative effort to ban BDS activity in Frankfurt. Here too I am delighted that the Israeli government had the courage of its convictions and refused to play along just to “make nice” with a foreign government, however friendly it might be. ROME —Leila Khaled, a member of the US and EU-designated terrorist Palestinian group Popular Front for the Liberation of Palestine (PFLP), who is conducting speaking tours across Europe to promote the anti-Israel Boycott, Divestment, Sanctions (BDS) campaign, was prevented from entering Italy. She was denied entry at Fiumicino airport near Rome. The move came a week after the European Parliament decided to ban members of terrorist organizations from addressing the body. The decision came after Khaled spoke at an event in September in the European Assembly in Brussels, using the stage to incite to violence against Jews and comparing Israelis to the Nazis. She glorified terrorism and trivialized the Holocaust. “Don’t you see a similarity between Nazi actions and Zionist actions in Gaza?,” she declared. “While the Nazis were tried in Nuremberg, no one has ever tried the Zionists,” she said. Israeli Minister for Public Security Gilad Erdan and several pro-Israel groups had complained to European Parliament President Antonio Tajani regarding Khaled’s speech. Kol hakavod to Italy for carrying through on the European Parliament ban. And kudos too to the European Parliament for instituting this (very belated) ban on terrorists and terror groups. Leila Khaled was a key member of a terrorist cell that hijacked TWA Flight 840 in 1969. A year later, she participated in the attempted hijacking of EL AL Flight 219. She lives in Jordan. Olga Deutsch, Europe Desk director at the Jerusalem-based NGO Monitor, applauded Italy’s decision to deny entry to Khaled. ‘’We have long warned European governments that they have been funding radical, politicized NGOs, including those linked to the PFLP terror group and which were involved with Khaled’s event,’’ she said. However, these successes notwithstanding, we still have a long way to go and there is no end in sight. The pro-Israel educational and activist NGO Stand With Us produced a video showing the highlights – or rather the lowlights – of the last week’s demonstrations around the world where pro-Palestinian, i.e. anti-Israel, protests descended rapidly into outright antisemitism, calling for Israel and the Jews’ destruction (as I mentioned in my post on the subject last week). Let us keep up the good fight. Remember the lesson of Hannukah – the few against the many, the righteous against the evil, the weak against the strong. With G-d’s help we beat the enemy then and we shall beat them again today. If only it wasn’t for Trump, I’m sure he would be dancing the hora and discussing how much he loves Jewish and not smashing Jewish store windows. We should never hold anti-Semites responsible for anti-Semitic violence. Instead we must blame Jews and their supporters for causing it by refusing to die. Just ask J Street, JVP, If Not Now and the rest of the gang. Don’t worry, firebombing a synagogue is anti-Zionist. Not anti-Semitic. Just ask the National Socialists. Or the plain old Socialists. Or the Islamofascists. Pro-Palestinian Arab demonstrators on Saturday night threw a firebomb at a synagogue in Gothenburg, Sweden, local media reported. According to the report, about 20 Muslim protesters who were demonstrating against U.S. President Donald Trump’s decision to recognize Jerusalem as the capital of Israel are responsible for the attack. The attack took place as Jewish students were holding a party inside the synagogue. A firefighter who was called to the scene told a Swedish news site that a fire had broken out between parked vehicles in a car park outside the synagogue. “The police came, they cleaned the place, and they checked to make sure that everything is in order. The parents came and took the children home. There were a few children who were very stressed. One of them told me that he was feeling very unsafe. Another told me casually that because he has a very Jewish name, it causes Arabs in his school to curse him, harass him and spit on him. It’s very hard for him,” continued Maoz. “I live ten minutes away. Relatively close. At the same time, I cannot say that we feel an increase in anti-Semitism every day,” he concluded. On Thursday, a man wearing a Palestine Liberation Organization (PLO) flag smashed the windows of the kosher HaCarmel restaurant, which is located in a heavily-Jewish part of Amsterdam. The suspect smashed the window and kicked down the restaurant’s doors before police officers who were on the scene arrested him. Today 29th November, or as it is quirkily called in Hebrew “kaf tet beNovember”, is the 70th anniversary of the fateful UN Resolution 181 which aimed to partition Palestine and created a Jewish area and an Arab area. As we all know, the resolution was rejected by the Arabs who never fulfilled any of its provisions or conditions, while it was accepted in full by the Jews. No sooner had the vote passed in the UN than 5 Arab armies invaded the newborn Jewish state with the overt intent of destroying it before it was born. They lost the war and the rest is history. The Resolution, which is often misunderstood, was merely a recommendation and carried no weight in international law. Palestinian Arabs refer to it as “The Partition Plan,” claiming, after all this time, that it gives them rights to a state. This is blatantly false, as they rejected this plan 70 years ago. According to international law, a party that rejects an agreement does not retain any rights based on that agreement. What is more, the recommendation was not simply that two states, one Jewish and one Arab, be established. It proposed that two states be joined by an economic union, with a myriad of requirements. The states were to share currency, transportation, postal systems, and a great deal more; both were to be democratic, provide civil rights and prohibit discrimination. Israel accepted this partition. However, acceptance was premised on what was described in the Resolution: economic cooperation and peaceful coexistence. Israel never agreed to disregard the nature of the Arab state recommended for creation at its border. In the end, Resolution 181 was abandoned and never came to fruition. The UN Palestine Commission charged with facilitating the Resolution never even met, and the Security Council would not lend support. The Commission was officially relieved of its duties. Israel, the sole party to accept Resolution 181, is not responsible for its failure, and is certainly not in violation of international law by not complying with it now. Keep this last paragraph in mind as we now read of the UN’s efforts to delegitimize Israel on a daily basis. In order to “celebrate” this auspicious day, the UN – as it has done every year for 70 years – makes it its business hold an International Day of Solidarity with the Palestinian People. Not the International Day of Solidarity with Israelis and Palestinians mind you. Just those most pampered self-made “refugees” in the world, the Palestinians, who only arrived at this glorified status because of their constant rejection of any Jewish State, of any size, anywhere in the Middle East at all. Isn’t it pathetic that the UN (Useless Nations) cannot find it within themselves to celebrate a National Day for the Inalienable Rights of the Jewish People to their own Homeland in the State of Israel. In a letter to Guterres, Prof. Gerald Steinberg – president of the Jerusalem-based NGO Monitor – argued that the Day of Solidarity, along with the numerous UN bodies that promote an anti-Israel agenda through various pro-Palestinian committees and agencies, undermine the UN’s stated desire for peace based on a “two-state” solution. In his letter to Guterres, Steinberg pointed out that the UN spends millions of dollars on pro-Palestinian activities every year. “In October 2017, 24 separate UN agencies contracted with the Palestinian Authority to spend more than $18 million on campaigns aimed at isolating Israel through coordinated political, economic, and legal attacks,” he noted, emphasizing the need for the UN as a whole to “accept the obligation to end the rampant and systematic discrimination against Israel that currently plagues the UN. The amount of money spent pampering the Palestinians is mind-boggling. Imagine how many genuine refugees and other minorities could be assisted with this money. Gutteres is actually relatively sympathetic to Israel, but whether he will have the intestinal fortitude to stand up and condemn his own institution’s racism is another matter. And if he does, will his words be heeded? I doubt it somehow. The UN’s Human Rights Commissioner began sending letters two weeks ago to 150 companies in Israel and around the world, warning them that they are about to be added to a database of companies doing business in Israeli settlements in the West Bank and in East Jerusalem, senior Israeli officials and Western diplomats involved in the matter told Haaretz. The Israeli official, who requested to stay anonymous due to the sensitivity of the issue, noted that the letters, sent by Zeid Ra’ad Al Hussein, said these firms were doing business in the “occupied Palestinian territories” and could thus find themselves on the UN blacklist for companies acting in violation of “internal law and UN decisions.” The letters, copies of which also reached the Israeli government, request that these firms send the commission clarifications about their business activities in settlements. The Washington Post reported in August that among the American companies that received letters were Caterpillar, Priceline.com, TripAdvisor and Airbnb. According to the same report, the Trump administration is trying to work with the UN Commission on Human Rights to prevent the list’s publication. Israel’s Channel 2 reported two weeks ago that the list includes some of the biggest companies in Israel, such as Teva, Bank Hapoalim, Bank Leumi, Bezeq, Elbit, Coca-Cola Israel, Africa-Israel, IDB, Egged, Mekorot and Netafim. Senior Israeli officials said the Israeli fear of divestment or scaled-down business due to the blacklist is already becoming a reality. They said that the Economy Ministry’s Office of Strategic Affairs has already received information that a number of companies who received the letters have responded to the human rights commissioner by saying they do not intend to renew contracts or sign new ones in Israel. International firms targeted by the UN Human Rights Council (UNHRC) for doing business with Israeli settlements will have legal recourse, a US-based pro-Israel nonprofit law group noted this week. It is expected that a “blacklist” of such companies will be published by the UNHRC by the end of this year — a move which both the US and Israel oppose and are lobbying against. According to the Washington Post, the list could include Caterpillar, TripAdvisor, Priceline.com and Airbnb. “It comes as no surprise that the proponents of the Israeli boycott — the Human Rights Council, NGOs, Arab League member states, and others — do not acknowledge the serious legal implications of actually carrying out the discriminatory conduct for which they advocate,” Benjamin Ryberg — the Lawfare Project’s chief operating officer and director of research — said. Lawrence Hill — the chairman of the Lawfare Project’s board — said the UNHRC’s “farcical conduct” demonstrated the necessity of the Israel Anti-Boycott Act — which is currently making its way through Congress. In 2005 Israel withdrew completely from the Gaza Strip without any kind of peace agreement. At the same time they also withdrew from the West bank city of Jenin and four nearby settlements, again without any agreement. The Palestinian response was indiscriminate firing of rockets from Gaza into Israel. The British were granted the mandate for Palestine at the San Remo Conference in 1920. In 1921 Britain separated what we now know as Jordan from the rest of the mandate, making Transjordan the Arab Palestinian State on 78 per cent of the mandate area, and banned Jewish settlement east of the River Jordan. In 1923 Britain ceded the Golan Heights to the French mandate of Syria. The remaining mandate area, 22 per cent of the original total, was to be the Jewish homeland. Read it for yourself! Do the UN and the Arabs want to go there? So where to now? On January 3 on Palestinian TV Palestine Liberation Organisation executive committee member Hanan Ashrawi, said: “We have refused and still refuse to say that Israel is a Jewish state.” The PLO was formed in 1964 when there was no Israeli occupied territory. So until there is a Palestinian leadership that accepts Israel as the Jewish State nothing much will happen. As is clear from the rest of his remarks, he was not talking merely about the “West Bank” and Gaza. He meant the whole of Israel would be “purified” of Jews. This man does not speak for Hamas. He is part of the Palestinian Authority, regarded by the west as “moderate”, and religious adviser to Abbas, regarded by the west as a statesman-in-waiting. Western “progressives” support the Palestinian Authority and support the Palestinan cause. What do they imagine Mahmoud al Habbash means by the world “purified”? How do they think he intends to put that word into practice in Israel? I’ll give them a clue. It will involve, at the very least, a war of annihilation, racist ethnic cleansing and mass murder. Only when the West finally admit to themselves that what they are working for is ethnic cleansing of the worst sort against the Jews, and when they apply the force of law and morals to the Palestinians, to all the Arab states and their international supporters, only then will we have a chance for peace. The left embraced Islamists to be tolerant. And ended up embracing Islamofascists. Even while bellowing that everyone who didn’t embrace them was a Nazi. While their new friends defended Hitler. Nasreen Khan, a former member of George Galloway’s Respect Party, made offensive remarks about Jews on Facebook five years ago. Miss Khan, a Muslim who has since joined the Labour Party, said they were ‘inappropriate and unacceptable’. But despite the remarks, she is on a two-person shortlist for the Labour nomination in a safe seat in Bradford at next year’s local elections. In 2012, writing under a video titled ‘The Palestine you need to know’, she said: ‘It’s such a shame that the history teachers in our school never taught us this but they are the first to start brainwashing us and our children into thinking the bad guy was Hitler. The Labour Party’s position is, no comment. But don’t worry. This isn’t anti-Semitism. It’s anti-Zionism. The two just happen to be really hard to distinguish.